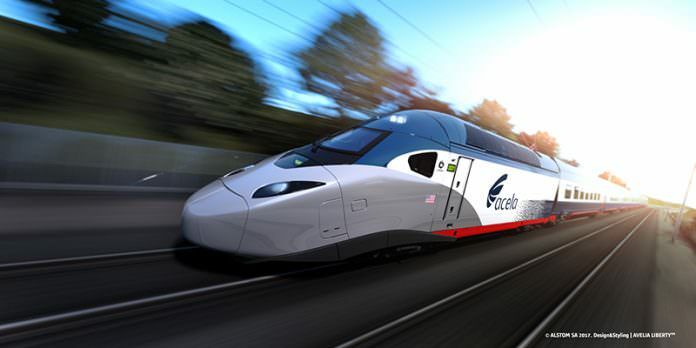 Alstom has unveiled the livery for the Avelia Liberty trains it is supplying for the USA’s Northeast Corridor (NEC). The new livery features Amtrak’s trademark red, white and blue design, which mimics the colours of the US flag. Amtrak placed an order with Alstom for 28 new trains in August 2016. Alstom is building the fleet at its site in Hornell, New York, and the trains are due to go into service in 2021. Appended to the order was a 15-year maintenance contract, which includes an option to extend for another 15 years. The articulated Avelia Liberty units will be fitted with anticipative tilting technology, which will help reduce journey times. The trains have a maximum operating speed of 186 mph (300 km/h). However, speed restrictions on the NEC will initially limit it to 160 mph (around 250 km/h).